spring 2016 Archives | Fashionitsa by Nitsa's!Fashionitsa by Nitsa's! 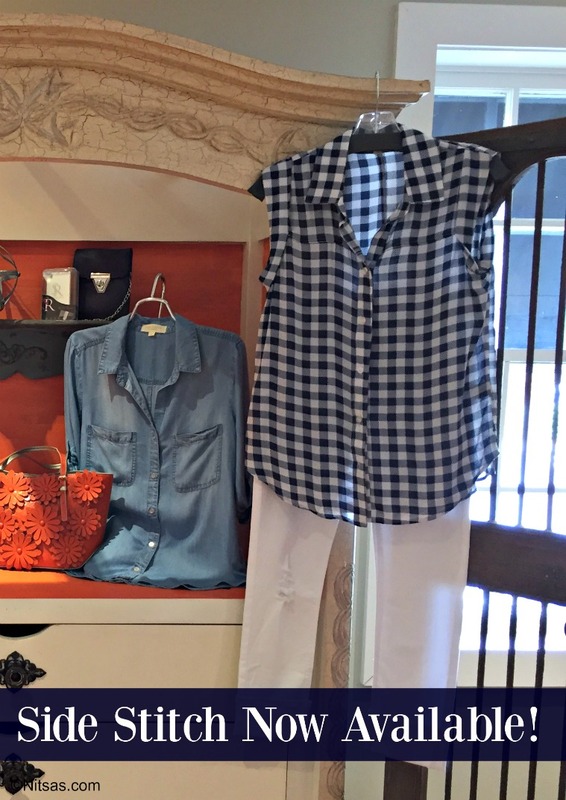 Just in time for those spring break getaways and cruises, Nitsa’s is launching a new resort-wear collection in their Winston-Salem boutique. Resort-wear lines that Nitsa’s will carry include Persifor, Roberta Roller Rabbit, Barbara Gerwit, HIHO, and Dizzy Lizzie. Persifor offers bright and whimsical prints in casual dresses, tunics, palazzo pants, and accessories like handbags, totes, and hats. Their machine-washable silky custom fabric features vibrant hues of blues, greens, and citrus. Persifor was founded by Alexandra Thompson, a Parsons New School for Design graduate, who has worked in design for such iconic brands as J. Crew and Lilly Pulitzer before launching her own line. Roberta Roller Rabbit is a travel-inspired lifestyle brand, offering exotic, sophisticated yet affordable leisurewear and accessories by designer Robert Freymann. Roberta Roller Rabbit is an offshoot of Freymann’s namesake label and was inspired by a fable of a magical rabbit that she found on a piece of discarded fabric in India. All of her pieces are hand-block printed, created and produced by Freymann with artisans in India. Popular prints include monkeys, elephants, and fish and complete the signature whimsical spirit that has become synonymous with the brand. Barbara Gerwit has designed a resort collection that is made up of hand-blocked, hand-beaded embroidered tunics and tops, and other related accessory items. Casual printed knit dresses and tops have now been added to this growing collection. Her light and airy fabrics are made of brightly colored cotton lawn, cotton Swiss voile, and laundered linen that has been constructed for easy care and washability at affordable prices. Prints include bright florals, pineapples, flamingos, and seashells. HIHO Clothing is inspired by life in the Caribbean with casual clothing including linen shirts and sweaters, beach dresses, printed cover-ups, and soft cotton t-shirts. HIHO clothing is based on a tropical lifestyle and influenced by the pristine environment of the Caribbean and island life. Clothing is soft, designed to be functional, colorful, and comfortable in a chic island way. The casual, cool, and elegant designs and original prints are the hallmark of the HIHO brand. With timeless, modern patterns and prints, the Dizzy-Lizzie line is a designer collection for the modern day woman. Founded in 2006 by designer Liz Lighton, these timeless dresses, pants, jackets, and “Tizzie” shirts are redefining the way women dress. Lighton’s passion for prints is shown through every detail in her clothes, such as the ribbon trims, stretched fabric, cuffed sleeves, and inner cotton linings. The collection features dresses, tunics, and tops in bold and colorful stripes, prints, and florals that are perfect for a cruise or a stay at an island resort. 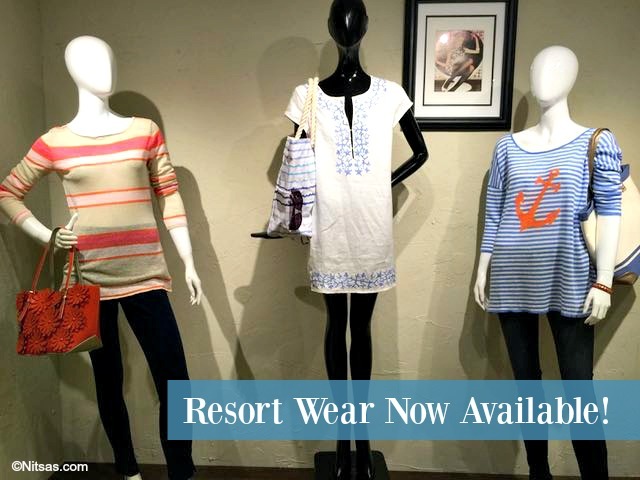 Stop in and see all of these beautiful resort-wear collections at Nitsa’s and get ready for your next vacation or bring a little bit of the islands to the Triad! Spring is almost here, and there’s no better time to update your wardrobe. And with the easy-to-wear and soft-touch pieces from women’s sportswear line Side Stitch, you’ll be ready for the warmer days ahead. Made in Los Angeles, Side Stitch clothing has a fresh California style with casual easy-to-care-for designs. Their Spring 2016 collection is perfect for the woman looking to update her wardrobe for the office, weekend, or night out. Influences from the effortless Southern California lifestyle are injected into the unique, ultra-comfortable designs that include short sleeve button- down tops, high-low hemmed shirts, and flowy lace-up tunics in a variety of bright colors. Relaxed denim and linen shirtdresses offer functional dressing options that can transition easily from office to a night out. Gingham, plaid, polka dot, and stripes add interest to this collection. Fabric is a key player in Side Stitch designs. They create fabrics with the softest touch possible, and their core denim pieces use a special eco-friendly fabrication. Side Stitch was created in 2013 and has been mostly carried by Nordstrom. As they expand into a full lifestyle brand with their Spring 2016 line, they are broadening their product assortment and will be featured in boutiques across the country, including Nitsa’s in Winston-Salem. The collection’s fabrics and silhouettes are so incredibly versatile that styles easily transition from season to season, and thus fit perfectly in today’s changing retail environment which favors the “buy now, wear now” concept.